Crosby Landscapes offer everything from a basic tidy to a full bespoke design and build package. 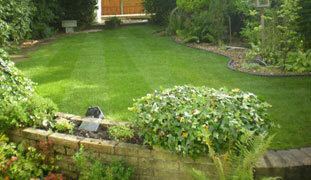 We’ve installed many new gardens and driveways, using top quality materials, throughout the North West. We offer a border design and planting service, or if you just simply require you favourite plants/trees, then we can supply them for you. Patio and Driveways. We install many types of paving to suit all tastes and budgets, ranging from high class natural stones to old reclaimed flag stones. Whether it is Traditional or Contemporary, a simple patio or vast terrace, small front garden or large driveway, we guarantee you will get the same beautiful final result every time. 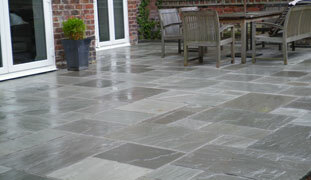 Block paving and Indian sandstone specialists. 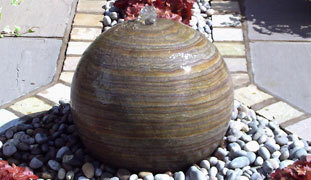 Moving water is very exciting but also very important in your garden, as well as being a valuable source of moisture for lots of wildlife, including birds, bugs and mammals, it also helps to keep the air cool, while you relax and listen to the soothing trickles, on those warm summer evenings. Fencing. We install many types of fencing including, feather board, T+G, V-arch, picket and many more. Security anti climb fencing can also be supplied and installed. 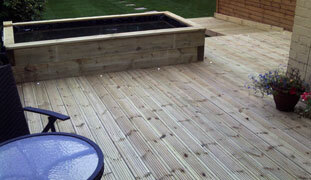 Decking, Pergolas and Sleepers. Crosby Landscapes construct bespoke decking on site to suit our clients requirements, from basic flat decks to more complex projects incorporating, raised planters, pergolas and even pools.